Hi everyone! Today’s card was made for my second card challenge with my friends. The theme was friendship. The sentiment reads “hi there” and then when you open the card it says “FRIEND”. 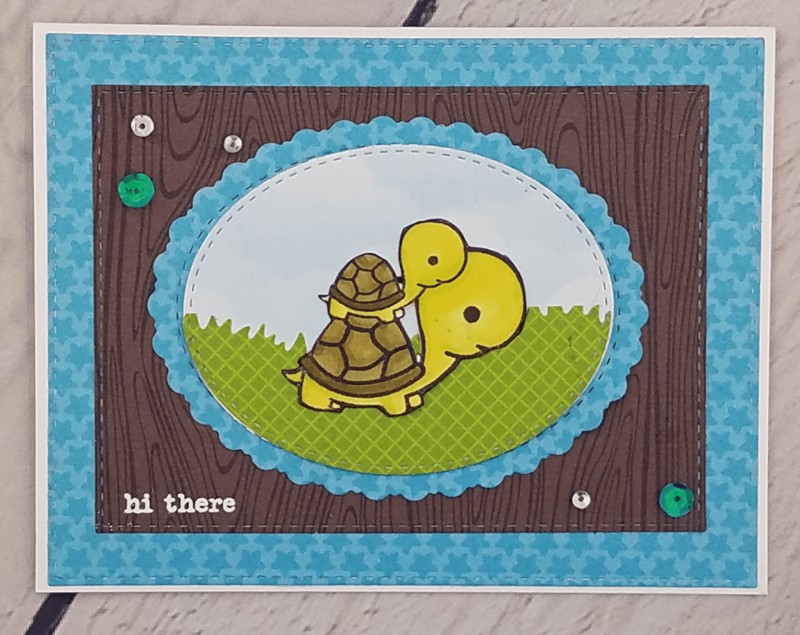 I used all Kat Scrappiness dies to create this card and the turtle came from the “Best Buds” stamp set by Joy Clair. I will have links below to all of the products I used to create this card. The sequins match the card but you can’t tell in the photo because of the lighting. Sequins are sometimes best seen in person 🙂 Lighting makes them look odd colors in photographs. I hope you liked my card. Next week’s challenge is “blue and silver”…so I have to come up with a card using those two colors. I have NO idea what I will make yet…those aren’t colors I use a lot, at least not together! Kat – Where do you get your envelopes for the cards you make? Thanks for sharing – I have relied on your website a lot.